Chevrolet says the Orlando has a bold look with a low roofline and crossover-inspired silhouette. Chevrolet will debut the Orlando minivan at the Paris auto show next month as part of the brand's European product offensive. "The new Orlando kicks off an ambitious seven-product launch program over the next 15 months," Chevrolet Europe head Wayne Brannon said in a statement. He added: "We're confident the Orlando not only brings great value for money to the minivan class but also something fresh -- function with attitude if you like -- and the opportunity for us to continue building our volume across Europe. I believe it will also bring more new customers to the Chevrolet brand." European unit sales at the the General Motors Co. subsidiary have been hit this year by the ending or phasing out of scrapping incentives in key markets such as Germany, Italy and the UK. 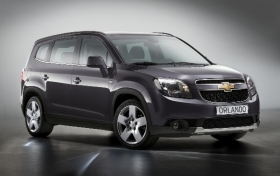 The incentives had boosted sales of low-cost, small cars that Chevrolet offers in Europe. The brand's European sales fell 4.7 percent to about 93,500 units in the first six months, according to ACEA, the European automakers association, giving it a 1.3 percent market share, down from 1.4 percent the year before. The Orlando launches early 2011. 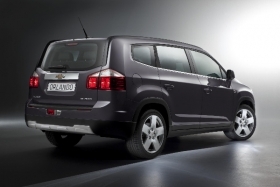 The Orlando will be the brand's first entrant into the European minivan segment when it goes on sale in early 2011. It will be offered in Europe with a 141-hp, 1.8-liter gasoline engine and a 2.0-liter diesel unit, offering 131 hp or 163 hp. The minivan is based on the Chevrolet Cruze sedan. An Orlando concept was first seen at the 2008 Paris show. Chevrolet said the production Orlando will be one of four debuts at this year's show. Also debuting are the new Aveo, Captiva and a five-door Cruze concept.